Quite the pitching matchup today. Actually, when you put the two worst teams in baseball, offensively speaking, you get a game like you do today. Listening to the post game show, everyone loves to rave about how the pitching was so spectacular. Jarrod Parker, the starter for the A's, went 7 innings and gave up three hits, one run and struck out 9 while walking 4. Yes, walking 4 batters. Watching the recap of Parker's performance you can see Mariner hitters swinging at a lot of terrible pitches and totally missing a lot of pitches right down the middle of the plate. I have a hard time giving credit to Parker and even more difficulty saying he was amazing today when he faced a team that has an inability to get things done at the plate. It was the same story for the A's who only collected two hits on the day. One, a first inning homer off of Kevin Millwood off the bat of Coco Crisp and the other, a seventh inning homerun from Yoenis Cespedes off of reliever Hisashi Iwakuma. Those two runs were enough to put the Mariners away. The M's lone run came off the bat of John Jaso who hit a solo homerun in the 2nd inning. Jaso had two of the Mariners 4 hits on the day as they continue to struggle at the plate. 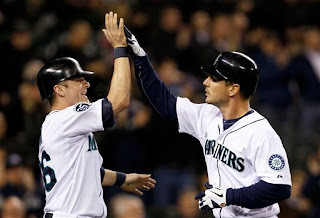 The Mariners scored a total of 4 runs in the series and continue to show a serious lack of offense at their home field. More frustrating than a lack of offense or the bad choices made by players at the plate were the choices by Mariners Manager Eric Wedge. In the 9th inning, after a John Jaso ground out, the M's were down to their final two outs and Justin Smoak came to the plate. Justin Smoak has had the coldest bat in the American League since winning the AL Player of the Week Award from May 28th - June 3rd. Personally, I would have brought in Casper Wells as a pinch hitter. Wells has been hot and was available to come off the bench. It gets worse. Smoak got on base via an error by third baseman Brandon Inge and there was a small glimmer of hope. 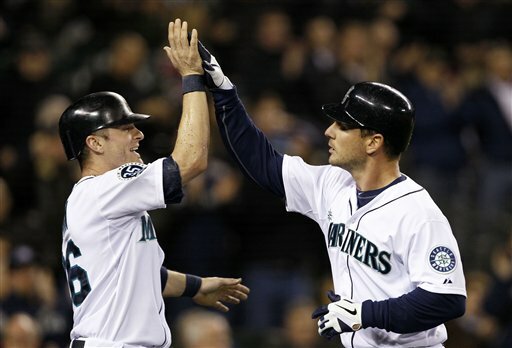 Munenori Kawasaki pinch ran for Smoak and that brought Dustin Ackley to the plate. Ackley has been another ice cold bat and there was still no pinch hitter. Ackley got a fastball right over the heart of the plate and he popped it up in foul territory down the left field line. FAIL! Oh wait, there's more. The next hitter? Brendan Ryan! Sure he came up big with a base hit last night, but he is still only batting .180 on the year and can hardly be called a hot bat. Still, no Casper Wells and the Mariners lucked out once again as the first pitch fastball by Ryan Cook hit Ryan and moved Kawasaki over to 2nd base. Now with the winning run aboard, Ichiro Suzuki came to the plate and had some of the worst swing on some straight fastballs that I have ever seen. Ichiro went down swinging and the Mariners lost the series to the Oakland A's. Not the type of series you want before a hard hitting Boston Red Sox team comes to town, but, it is what it is. We need to be doing something different and Eric Wedge keeps saying that same thing to the players. Always talking about them needing to adjust, but what about Wedge? I think he needs to adjust. There is a piece that is supposed to bring all these pieces together and make this team a winner and that is the Manager. So far, we're still going backward and our key players are only getting worse. Smoak, Ackley, Jesus Montero, Michael Saunders and even Kyle Seager are all getting worse as the season goes on and that is a problem that needs a little more attention from the top than what is being done right now.